Take your grilling to the next level with bold and authentic international recipes from America’s bestselling, award-winning grilling authority, Steven Raichlen. In this multi-touch book made with iBooks Author and specially designed for the iPad, the man Esquire called “America’s Master Griller” has gathered the most eye-popping, jaw-dropping, most guaranteed-to-wow recipes from his extensive travels around Planet Barbecue. Mouthwatering photographs plus step-by-step slide shows and video bring smoke, spice, and sizzle from faraway places right to your backyard. Secrets of the World’s Best Grilling, available only in the iBookstore, contains a selection of recipes published in the print edition of Planet Barbecue!, along with video content exclusive to this interactive edition. 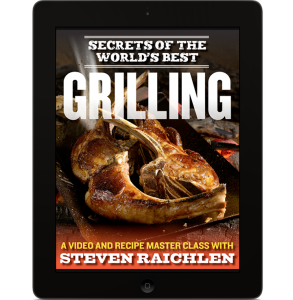 – Instructional videos that have you grilling side-by-side with Steven Raichlen—each chapter begins with a video showing a recipe preparation from start to finish. – Photo slideshows throughout breaking down the techniques with step-by-step instructions. Learn how to make a sensational Spiessbraten from the Rhine-Palatine region of Germany. Curried pork kebabs from Cape Town, South Africa. From Buenos Aires, a chimichurri-topped strip steak. Gaucho-Style Beef Ribs straight out of Brazil. Lamb on a Shovel from Australia. Mussels Grilled on Pine Needles from the western coast of France. It’s a travelogue and cookbook all rolled into one. Millions of grillers have honed their skills with Steven Raichlen as their guide. Now, in his primer on live-fire cooking from around the world, he’s taking it up a notch. Fasten your seatbelts and join him on a rip roaring tour of the world’s barbecue trail.